Assembly of First Nations National Chief Perry Bellegarde carries the eagle staff as he walks onto the stage for the opening of the AFN Annual General Assembly in Vancouver on July 24, 2018. 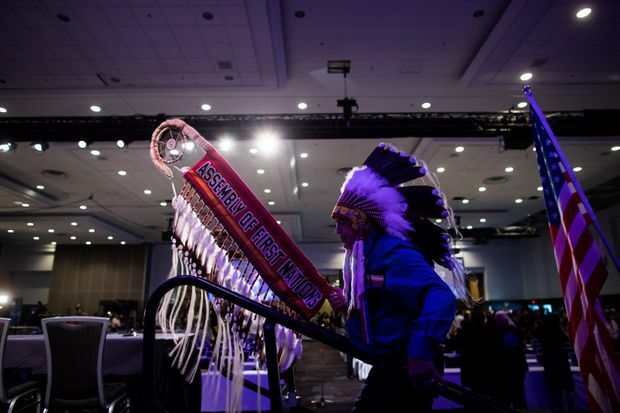 Members of the Assembly of First Nations have gathered in Vancouver to choose a new national chief to advance their agenda with the federal government just as the issue of expanding the Trans Mountain pipeline has deeply divided the organization. It’s a situation that could create challenges for whoever ends up as chief in voting on Wednesday, either a re-elected Perry Bellegarde, or one of four rivals seeking to succeed him as leader of the high-profile organization central to debates between Ottawa and First Nations. Chief Jim Boucher of the Fort McKay First Nation in Alberta, which has supported the project, said there are divisions over the plan to expand the pipeline between Edmonton and the Vancouver region, and work ahead to achieve unity. On Wednesday, Mr. Boucher and the chief of the Mikisew Cree First Nation were to hold a forum with a keynote address called “Nation to Nation: Investing in the Trans Mountain Pipeline, Together” to make the case for First Nations being major investment partners in the project, according to an invitation. In May, Ottawa said it would purchase the pipeline and associated infrastructure from proponent Kinder Morgan for $4.5-billion. Mr. Boucher said supporters of the pipeline need to hear out First Nations critics of the project to “minimize or mitigate their concerns" to work toward a solution acceptable to all First Nations. “I anticipate we’ll have quite a participating crowd of chiefs,” Mr. Boucher said. He said he sees Mr. Bellegarde as having been supportive of First Nations participating in the Canadian economy, and that he hopes whoever is elected allows a balanced approach to the issue. Mr. Bellegarde’s representative said he was not available for comment on Tuesday and did not respond to a request for comment on his views. 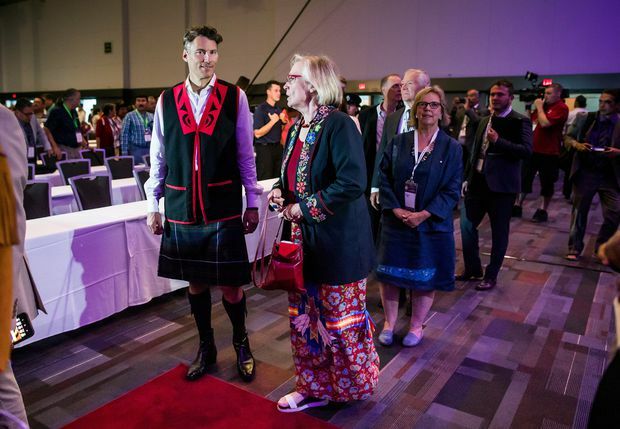 Vancouver Mayor Gregor Robertson, left, Minister of Crown-Indigenous Relations Carolyn Bennett, centre, and Green Party Leader Elizabeth May, right, walk in the grand entry at the opening of the Assembly of First Nations Annual General Assembly in Vancouver on July 24, 2018. Trans Mountain critic Judy Wilson, a B.C. chief who is also secretary treasurer of the Union of B.C. Indian Chiefs, said she hopes to attend Wednesday’s forum to raise concerns about risks and liabilities associated with the project. Chief Bob Chamberlin, vice president of the Union of B.C. Indian Chiefs, said Trans Mountain is the latest in a series of “tension points” that will continue to occur until Ottawa respects First Nations authority within their territory. The five candidates for the leadership are Mr. Bellegarde, a former Saskatchewan regional chief for the AFN in his first term as leader; Russell Diabo, a Mohawk policy analyst from Kahnawake, south of Montreal; Sheila North, Grand Chief of Manitoba Keewatinowi Okimakanak, representing 30 First Nations in Northern Manitoba; Miles Richardson, former president of the Council of the Haida Nation in B.C. and current director of the National Consortium for Indigenous Economic Development; and Katherine Whitecloud, former Manitoba regional chief of the AFN. Wednesday’s vote involves chiefs of more than 600 First Nations or their proxies. Delegates listen as Assembly of First Nations National Chief Perry Bellegarde speaks at the AFN Annual General Assembly in Vancouver on July 24, 2018. Mr. Richardson said government has made a mistake in leaving First Nations as an “afterthought” in actions related to the pipeline. “With me as national chief, First Nations in their territory are going to stand up and have their sovereignty, their jurisdiction respected,” he told reporters. Mr. Diabo, who is sharply opposed to the project, said that if he is elected national chief, he will do whatever he can to make sure it is never built.